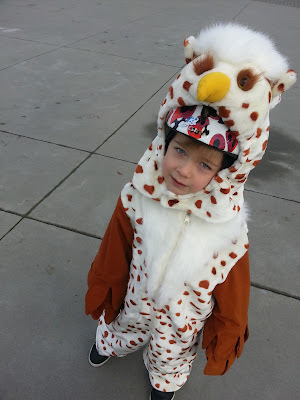 The owl costume fit over a bike helmet! Sunday was a crisp fall day without any rain in the forecast. Not quite cool enough to need gloves, but not warm enough to overheat in costumes. Perfect for our YVR Family Biking Halloween Ride. After pulling the kids' fuzzy one-piece Halloween costumes on & grabbing our own funny hats, we zipped down the hill to Science World to see who turned up for the ride. Not long after we arrived, a woman rode up with her toddler on a bike seat, both of their helmets decorated with black feathers, googly eyes & beaks. Must be one of us! After introductions, we started chatting with Nell while the kids ran around outside Science World. After waiting a few more minutes for anyone else to arrive, we decided to head west along the seawall to Kits Beach playground. 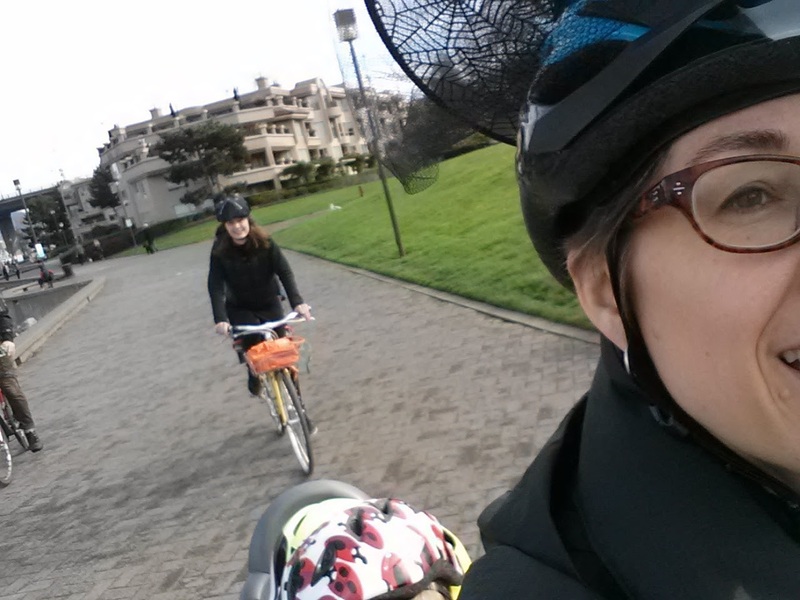 I didn't have a preplanned route, so we just biked all the way along the seawall, no detours. Tourist season is well over, so the path wasn't too busy. 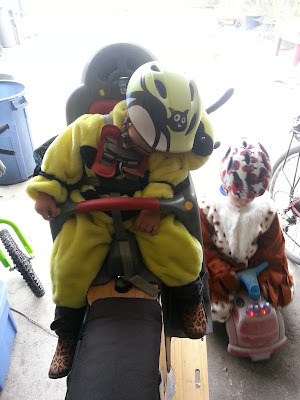 We got lots of smiles as we rode past: I guess most people don't regularly see a bumblebee, an owl, a witch, a viking & two crows glide past on bikes. Though there weren't a huge number of pedestrians on the seawall, we still had to weave around them & be very alert for off-leash dogs & people walking three or four abreast. Almost got all of us in the shot along the seawall. I'll be happy once the City of Vancouver completes the improvements to the South False Creek Seawall so that the pedestrians & cyclists are safely separated. Besides the potential for pedestrian/cyclist conflict, the various types of paving are in poor condition. By the way, if you're interested in more information about this project, visit the City of Vancouver South False Creek Seawall page for details. The open houses are past, but you can still contribute your suggestions in an online survey. Witch, Viking, Bumblebee, Two Crows & the shadow of our five-year-old photographer/Owl. 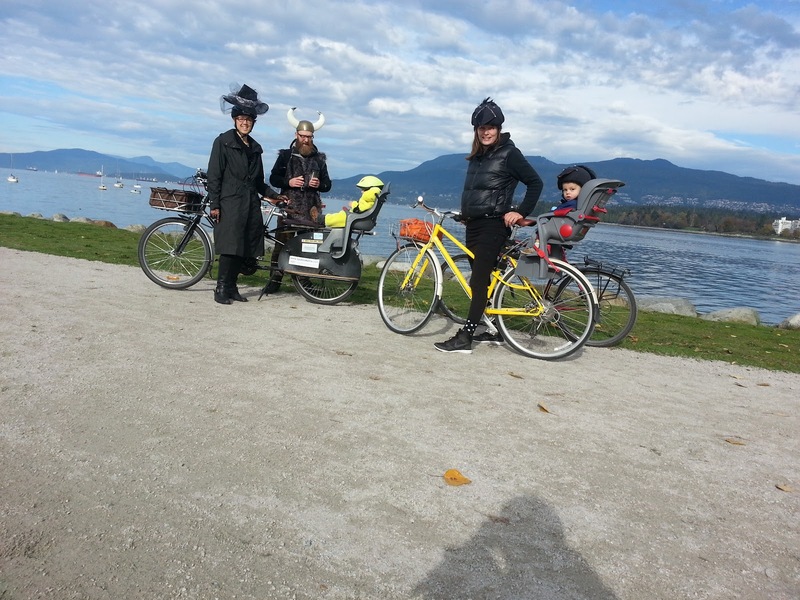 We stopped for a group photo in front of the glorious view at Vanier Park. Linnaeus refused to be photographed, so I got him to take the picture instead (hence the 10 degree angle!). The little crow, owl, & bumblebee buzzed around the playground for a good hour while Nell & I had a chance to chat about her work & biking with kids. I got an idea for a blog post even. Nell & her son headed off west around lunch time & we took the faster route via Cypress & 10th Avenue eastward. We had an afternoon birthday party at a pumpkin patch to get to. Since we were riding between 12:30 & 2pm, Bronte fell asleep. She just can't stay awake when it's near naptime & she's strapped into her Yuba Peanut Shell. 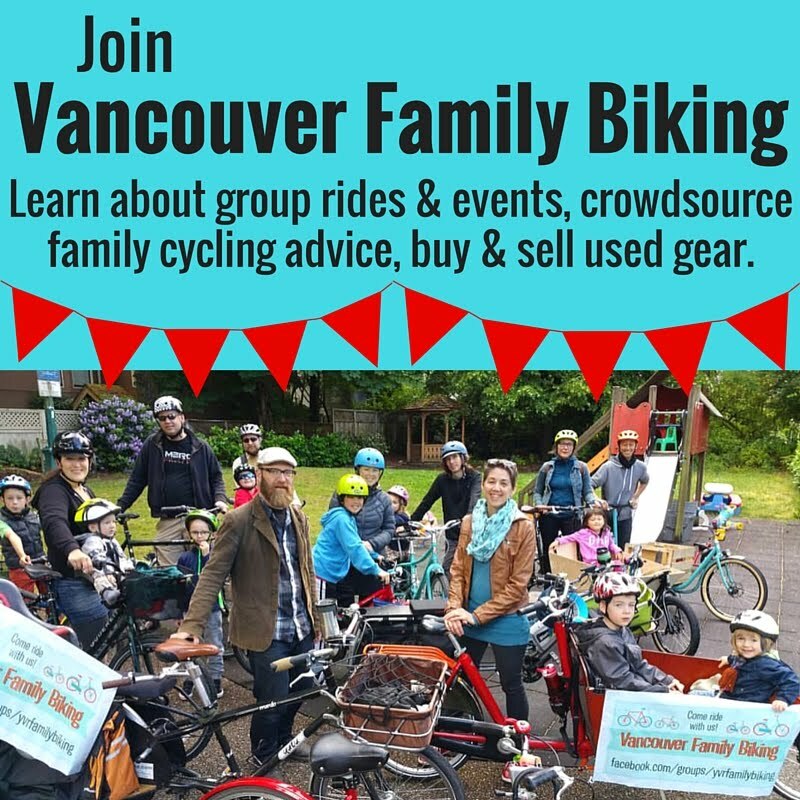 I'm already thinking about the next YVR Family Biking Rides. I'd like to do one to see the Christmas lights in December. Got any ideas for somethere you'd like to ride in November?